Lock your prop, or let it spin? The debate has raged for as long as sailing boats have had propellers, and everyone has their own theory. Brunel probably tussled with it when he designed Great Britain, and it has certainly kept waterfront bars the world over humming with arguments ever since, as to which mode gives the least drag when you are sailing. There are two sides to this endless argument. Lockers say that if the prop is spinning, some force is causing it to spin, and that force creates drag, which slows the boat down. Spinners reply that dragging a fixed three-blade prop through the water causes much greater drag, slowing the boat more. In fact, both are correct to some degree, but which causes least drag? That is what determines whether you should lock or spin, and that’s what we set out to measure. When the prop is fixed, the water flow hitting the blades is deflected to one side, causing drag. If the prop is spinning, the water will be deflected, but through a lesser angle, causing less drag. To visualise this, imagine rushing through a revolving door, just as one of the panels has gone past you. If the door is spinning, and you bump into that panel, you won’t get much of a shock. If the door is stationary, however, you will be nursing a bruised nose for some weeks. 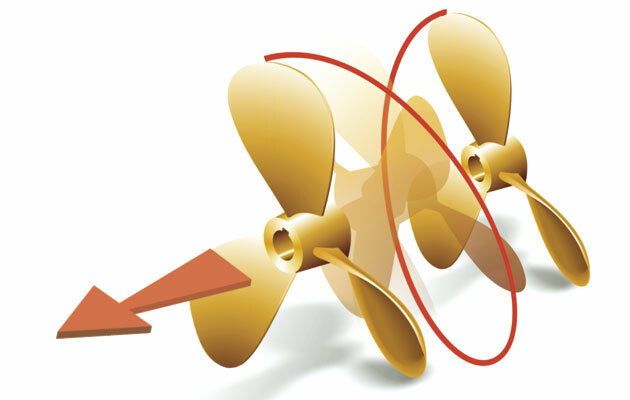 The amount of the spinning drag will be affected by the pitch of the propeller. Pitch is defined by the angle of the blades, and represents the distance forward the prop would move in one revolution assuming no slippage. Props with lower pitch generate more torque under power, so they will pick up speed quickly but top speed will be lower, the engine won’t be working hard enough and they create more sailing drag. Props with higher pitch generate more speed under power, so they will pick up speed slower but eventually go faster, the engine may be working too hard but they generate less sailing drag. As with most things, the choice is a compromise based on performance priorities, engine RPM and gearbox ratio, but a prop for a typical cruising yacht will have a pitch of 10-14in, in which case the drag of a spinning prop will be less than that of a fixed prop. The test rig worked as we had hoped, and gave remarkably consistent results as the speeds increased. Using the electric motor allowed us to get figures for equal levels of power, which equate to equal wind speeds. The hull speed of our boat restricted us to a maximum speed of 5 knots, but in reality it is at these speeds that the drag of the prop has its greatest effect. Our graphs show the results, which dramatically confirm that wherever possible you should let your fixed three-blade prop spin. The drag when it was locked was nearly three times the drag when spinning, and the loss of speed was over half a knot at 4 knots, and extrapolated to be 0.75 knot at 6 knots. That means getting to your destination two hours earlier on a 16-hour passage. And a folding or feathering prop will increase these speeds by a further 10 per cent or so, which is not insignificant. A locked, three-bladed prop generated nearly as much drag as a 10in bucket! 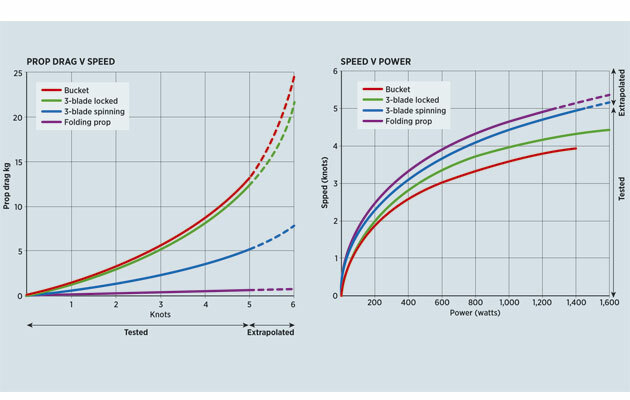 To put these results in context, towing a 10in diameter bucket produced just 10 per cent more drag than locked prop. The results show that our spinning three-blade prop creates considerably less drag. Many gearbox manufacturers have their own restrictions on whether you should lock or spin. Almost all of today’s hydraulic boxes can be safely left to spin in neutral but in the past, some hydraulically-operated boxes had their lubricating oil pumps driven by the input shaft from the engine, so if you left them in neutral under sail, with the engine stopped, they would suffer oil starvation. On the other hand, some mechanical boxes actually warn you not to lock them in gear when sailing, as the load on the fixed prop can damage the internal components of the box, and even turn the engine over, so you should let them spin. 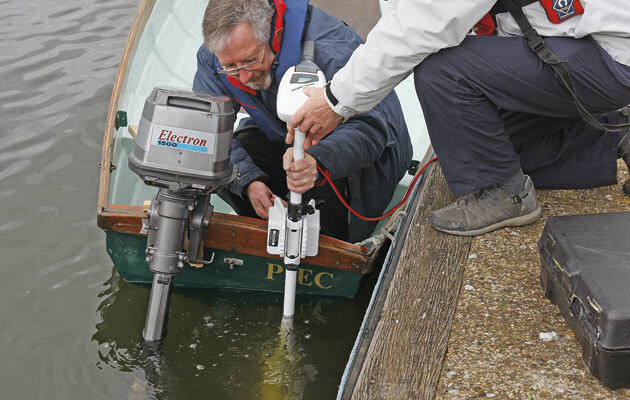 As always, check the specific instructions for the gearbox in your boat before deciding. Unsurprisingly, the graphs above show a compelling reason to fit a folding prop if your boat has a saildrive or P-bracket. If you have a long-keel yacht, with a thin-bladed two-blade prop set in an aperture, and you have a mark on the shaft telling you when the blades are vertical, then you will also have minimal drag. But with a fin-keeler, if the prop is behind a P-bracket, there will be little gain in orientating the blades vertically. 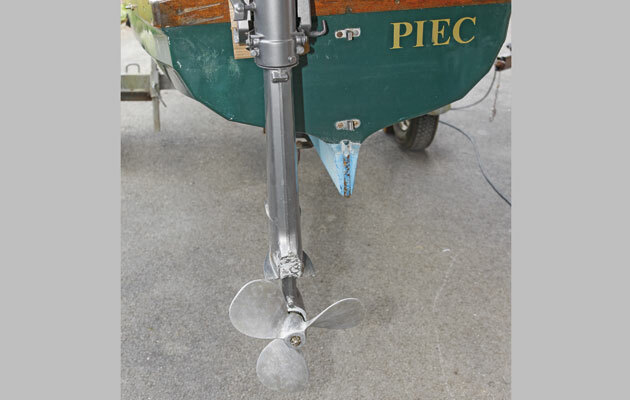 The drag of a three-blade prop on a saildrive will be almost identical to our test, as our outboard leg was similar in section to a saildrive, rather than a P-bracket. We wanted to measure the drag of a 12×12 (12in diameter and 12in pitch) three-bladed prop accurately, first fixed, then spinning, over a range of speeds. 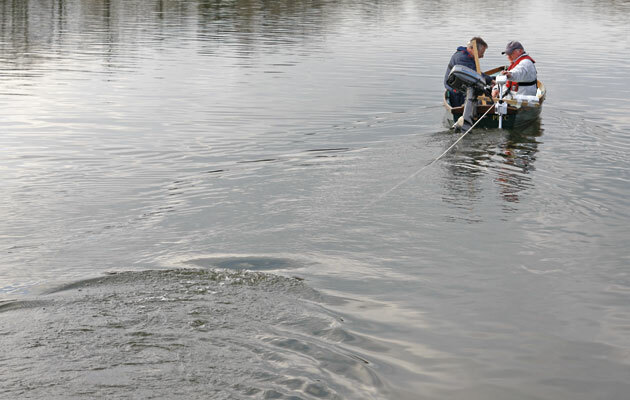 Then, as a comparison, we measured the drag of a folding prop supplied by Darglow, and finally we towed a bucket behind, to see how much drag that generated. 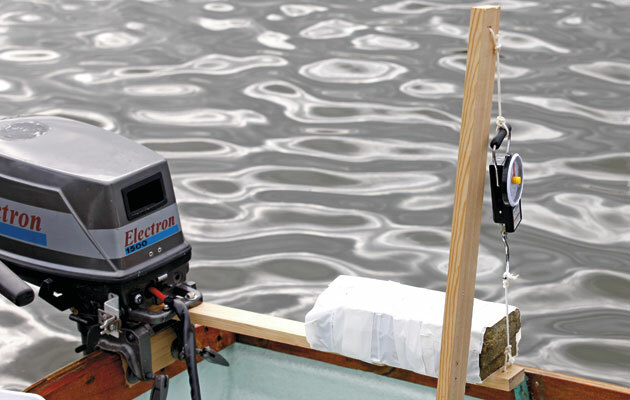 To measure drag, we mounted the props on an outboard motor leg, clamped to the transom of a 14ft skiff. 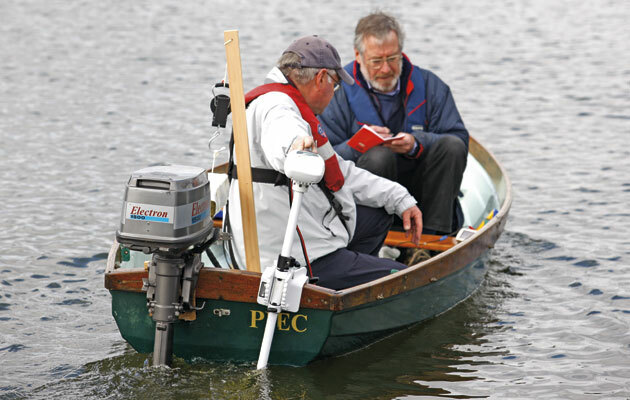 We then powered the skiff with an electric outboard mounted alongside, measuring the current and volts of the motor to determine the reduction in speed caused by drag for a given power – we used electric power, at sea it’s the wind. In practice, the amount of spinning drag will be increased from the theoretical level, as some force will be needed to overcome the friction in the gearbox. Even in neutral, a gearbox will have some internal drag, but this has less effect on the boat than locking the prop. Our test leg had a gearbox, so it closely replicates the real situation.